For owners of private wells, at one time the only method for dealing with common bacterial issues was chlorination. Well owners either “shocked” their well with chlorine from time to time or installed permanent chlorination, which consisted of a chemical pump injecting chlorine and a large retention tank to give the chlorine time to work. In recent years controlling microbial contamination with a more modern approach, the ultraviolet germicidal lamp, is becoming the method of choice. What is more, UV, which was once considered almost exclusively a well water treatment, has now become a common fixture of residential water treatment for city water users. This has happened because of increasing awareness of city water microbial issues. Boil water alerts, broken water pipes, awareness of crumbling infrastructure, the presence of microbes that are not handled by chlorination, and a general mistrust of water suppliers to solve all problems have all contributed to increased demand for UV units for city homes. 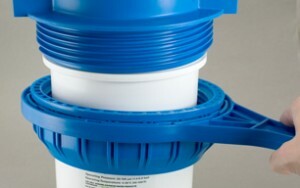 In response to demand for city water units, there are now many excellent point of entry (whole house) UV systems that combine UV disinfection with one or two generously sized filters to treat not only sediment but also taste, odor, chlorine (or chloramine), chemical contaminants and even such difficult city water issues as lead. A good example of the fine UV units now available is the moderately-priced 18-gallon-per-minute ultraviolet unit shown above. It’s an ideally sized UV system for all but the very largest residential users, treating a generous 18 gallons of water per minute for bacteria, cysts, and viruses at a strong 30 mJ/cm2 UV dosage. The VH420 unit comes with its own 5 micron sediment filter, conveniently mounted on a U-shaped rack that can be pointed in either direction to meet the installer’s requirements. It is backed by the many years of experience behind the Sterilight and Trojan brands, now merged under the Viqua name. The dosage rating for this powerful residential unit is 16mJ/cm2 @ 34 gallons per minute (twice as strong as needed to eliminate E. coli), 30mJ/cm2 @ 18 gallons per minute, or 40mJ/cm2 @ 14 gallons per minute. 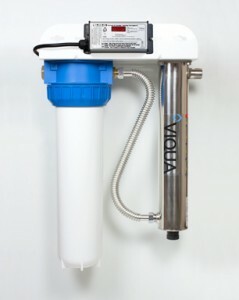 The unit’s 5 micron sediment filter is mounted in the unique Viqua easy-service housing (see picture below) that accepts all standard radial flow 4.5″ X 20″ cartridges. See full details on the filter housing here. The high quality Viqua UV lamp is equally easy to service. Lamp change can be done without turning off the service water. The advanced Viqua filter housing has a bottom plug that allows you to drain water from the housing before opening the sump. This makes for an easy, no-spill cartridge change. The unique housing accepts all 4.5″ X 20″ sediment and carbon block cartridges. In addition to the two-stage rack-mounted system, there are three-stage systems with a sediment filter, a carbon block filter, and the UV chamber. Viqua now offers a city water system with a lead removal carbon block as well.